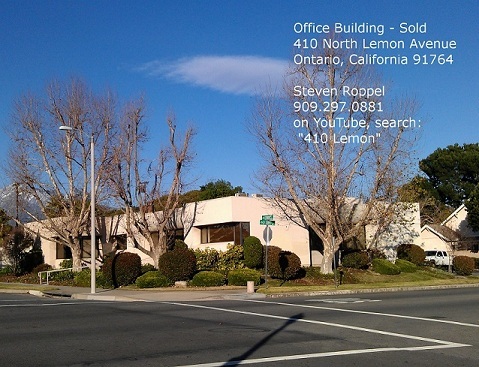 Ontario Office Building - Just Sold - News - Resources - Allied Commercial Real Estate, Inc. The quick sales transaction to a well-established local Chiropractor was completed in less than thirty days from purchase offer to close of escrow. The seller had previously purchased a larger property in Upland, California, and was in the process of relocating when escrow opened. The buyer had been renting nearby offices for over 20 years and is excited to now be his own landlord. The timing worked out perfect for both the seller and the buyer. Preview on YouTube, search: "410 Lemon". The main feature of the free-standing building of less than 5,000 square feet is an abundant amount of parking within the parking lot, with 29 parking spaces for a parking ratio of 6.3 spaces per 1,000 square feet, much more than a typical office building parking ratio, which is 4 spaces per 1,000 square feet. With the extra parking medical uses are possible, including: chiropractor; health clinic; pharmacy; dentist; orthodontist; physical therapy; counseling; or psychiatrist uses. The single-story office building is well integrated into the neighboring community; the grounds are professionally landscaped with neatly trimmed shrubbery and trees presenting a pleasant, professional business appropriate appearance from the street. Located at the northeast corner of the intersection of North Lemon Avenue and East D Street, the immediate neighborhood is Downtown Ontario. To the south is the City of Ontario complex, which includes multiple municipal buildings, including City Hall and Library. To the west, are nearby significant commercial office and retail development properties with the majority along the Euclid Avenue corridor, just one block away. About 2.5 miles south to 60 freeway and about 1.5 miles north to 10 freeway. Steven Roppel, SVP, Allied Commercial Real Estate, can be reached at (909) 297-0881, %3Ea%2F%3C6000ps4000ps2000psg1000psleppoRS%3E%226000ps4000ps2000psg1000psleppoRS3000psot2000ps%22%3Dferh%20a%3C. An Experienced Commercial Real Estate Broker Focused on the Inland Empire, California, representing landlords, tenants, sellers, buyers, leasing and selling: offices, retail properties, industrial, land, and investment opportunities in Southern California.